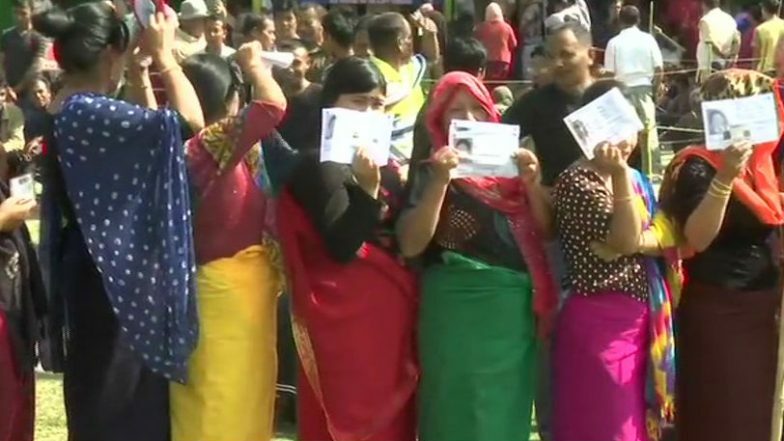 Dibrugarh (Assam), April 11: Polling for 91 Lok Sabha constituencies, spread across 18 states and two Union Territories, began on Thursday morning amidst heightened security. Among the constituencies going for polls in the first phase are - eight in Uttar Pradesh, five in Uttarakhand, four in Bihar, seven in Maharashtra, five in Assam, four in Odisha, two each in Jammu and Kashmir, Arunachal Pradesh, Meghalaya and West Bengal, and one each in Chhattisgarh, Manipur, Mizoram, Nagaland, Tripura, Sikkim, Andaman and Nicobar Islands and Lakshadweep. Assembly Elections 2019 Phase 1 Live News Updates: Voting Underway for 175 Assembly Constituencies of Andhra Pradesh. Over 14 crore voters will decide the fate of 1279 candidates who are in the fray. More than 1 lakh polling booths have been set up across the country, the EC said in a statement issued on Wednesday. It also mentioned that 7764 third gender voters will exercise their franchise in the first phase.Voting for 543 Lok Sabha seats will be held in seven phases - April 11, April 18, April 23, April 29, May 6, May 12 and May 19. Counting of votes will be done on May 23. Lok Sabha Elections 2019 Phase-I Voting Live News Updates: Polling Underway For Five Lok Sabha Constituencies in Uttarakhand. On Wednesday, Chief Election Commissioner Sunil Arora had urged citizens to come out and cast their votes in order to strengthen democracy. "It's a humble appeal that more and more people should come and cast their votes so that the bedrock of democracy strengthens. Our efforts will be fructified if each one of us who is an elector shows adequate zeal and faith in the democratic system," he had told ANI. Elaborate security arrangements have been put in place for the Lok Sabha elections and tight vigil is being maintained at interstate borders.